Welcome to a new week of Ten Things of Thankful! 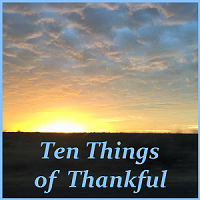 Thank you for your part in making our Ten Things of Thankful blog such a wonderful experience! Welcome to a brand new year of Ten Things of Thankful! Please take a moment to answer the following question in the comments section below. It's a fun way for us to get to know each other a little better. Did you make any resolutions or choose a focus word for the new year?